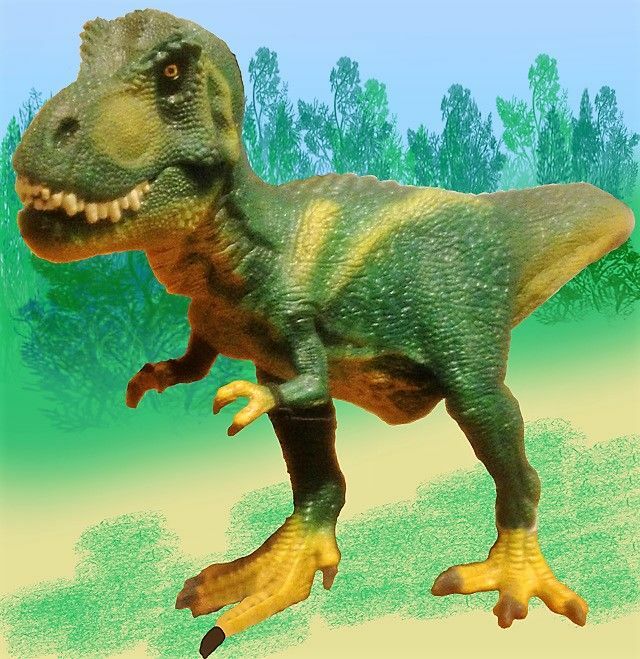 Here's a place for any and all photos of toy or model dinos. 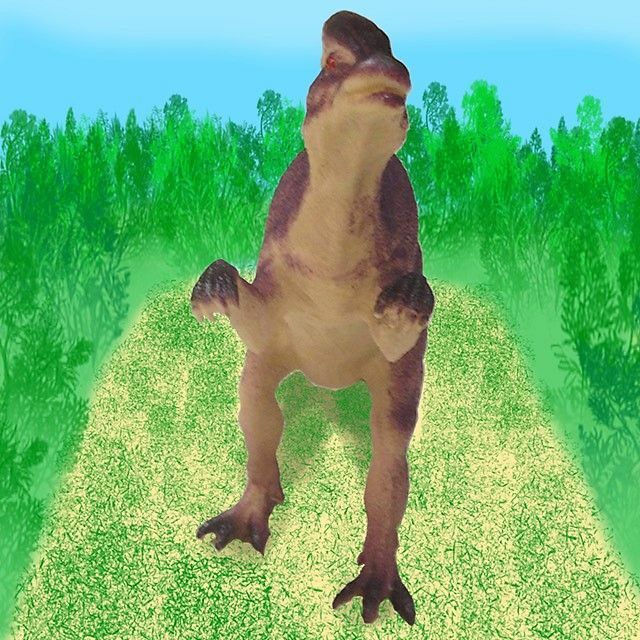 You can show a solo dino or several in a scene -- and if you use (or would like to experiment with) GIMP, go ahead and add a background. By all means describe where you obtained the model as well as any interesting thoughts you have about it. Back in 1993 Jurassic Park was the big film of the year and my younger brother and I had a big selection of merchandise at the time from the film. The thing is, 25 years later we still have most of it! It's sealed up in a big cardboard box up in my father's attic. Might dig it out and have a look at it sometime, just for old times sake. With some 25 years passing since Jurassic Park, you can now view your sealed box as a "time capsule." 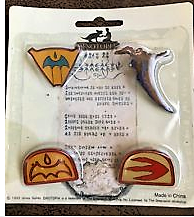 Should you choose to open it, please share some photos of the JP stuff from that era. A co-worker showed me this toy, asking me to identify the species. To me it appears like the Dilophosaurus of Jurassic Park fame, with a rather oversized crest. Or else it's just some scary-looking generic beast. Any suggestions? Regardless, it appears that Not evil, just hungry may not apply to this monster! 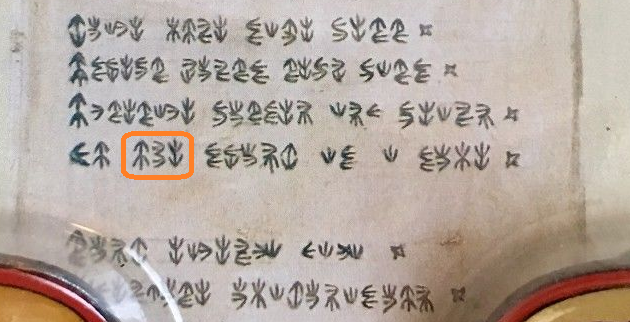 It's "saurian," but not ancient. 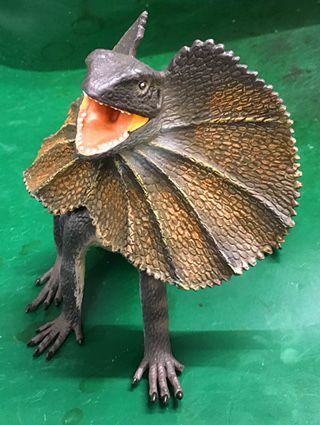 It's a frilled lizard. They're pretty cute and I loved to watch video of them running when I was a kid. Well, there goes my cred as the workplace's "dino expert" out the window! 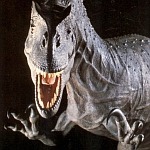 Mind you, this is what dinosaurs would have looked like according to Hollywood back in the 50's and 60's. I always like it when you watch a film from that time (such has Journey to the Center of the Earth and the special Effects department simply stick a rubber fin on the back of a Kommodo Dragon. archivist, if you know of any good (or semi-good, or even cheesy) classic dino flicks, let me know -- perhaps I haven't seen some of them. Those of us who like to arrange a few toy/model dinos on a shelf, etc. often find it difficult to have them appear convincing together when they don't follow the same scale. For example, if your trike is about 6" long, you'll need a Brach that's about one foot tall to line up nicely. Often these large sauropods from Carnegie or similar get quite expensive. Thus I was surprised to find a downright huge Brachiosaurus in the Fieldstation: Dinosaurs gift shop that I could bring myself to buy. It's not the same quality as the high-end brands, yet good enough. 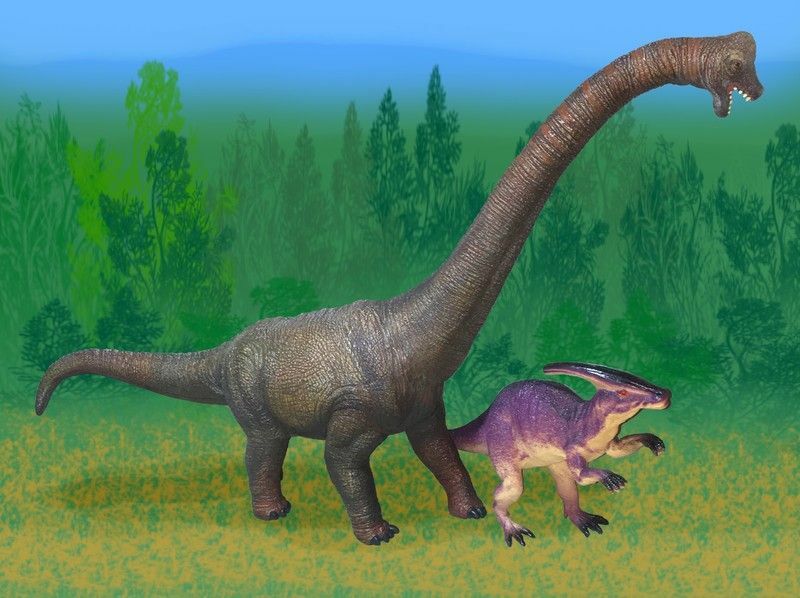 Below you see it next to a Parasaurolophus -- we see how they fit reasonably well together. I made the original photo with a mat used as a "seamless background:"
I was hoping to have GIMP automatically place the toys on their own layer using either the advanced selection tool or the Color to Alpha tool. Neither worked well so I had to painstakingly outline them by hand, a two-hour process. PaintShop and no doubt some other programs can handle this much better, but I know of no free / open source program with a good auto-select tool. My local Tractor Supply Co. store has a Schleich toy display of mainly farm animals, yet buried in lower shelves are a few dinos. Every one a meat-eater but for a Therizinosaurus (which looks like a carnivore anyway). I guess that's what kids want to play with. Even the New Jersey State Museum gift shop, on my recent visit, was all out of sauropods -- although Stegs and Trikes were on hand. 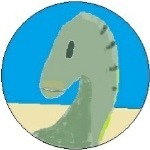 Anyhow, this image is of a recent model Tyrannosaurus rex. 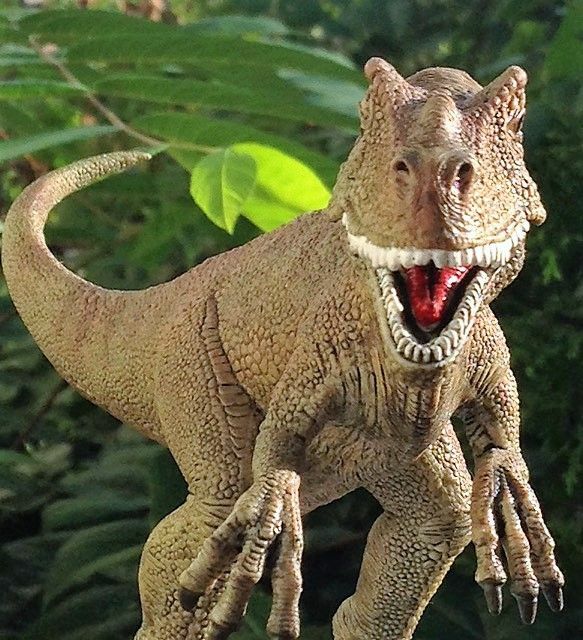 Like many Schleich figures its jaw can open or close. I show it closed in line with Mr. Gurney's observation that animals open their mouths only when needed. Nonetheless, this guy looks hungry and evil, the frightful dread of convoys and all who risk the Rainy Basin. I've been keeping the tags on my dinos because someday I'll pass them on to a child -- they have been imperfectly removed in the image. "Fish? Are you kidding me? You're my 'Catch of the day!'" 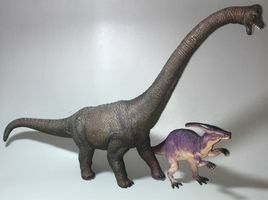 The bookstore in which I work also has these dinos by the exact same company. They are of very nice quality. If we ever received an Allosaurus model, I'd buy it. It's my nephew's 3rd birthday this weekend so yesterday I went into town to find a present for him. In a toyshop I was looking around and I came across a action figure range with the brilliant name Chompsquad! Interestingly enough when you look at Meet the Characters part it introduces you to a Brachiosaurus that helps tackle fires and a Pterosaur and his pilot who 'are responsible for alerting the squad of emergencies, general intel from above and fast evacuations'. Anyone who was around in the late 80's and early 90's might remember a similar (and much-older-aimed) toy range called Dino-riders which had a similar human-dinosaur team emphasis. (I brought him something with Paw Patrol on it eventually). 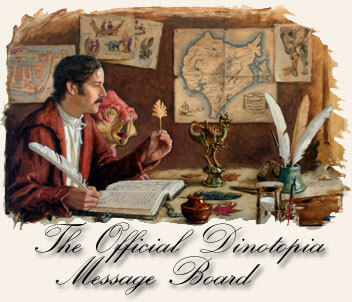 Well if this doesn't sound like Dinotopia ... It reminds me of the Star Wars plagiarism described here. It reads, "Do oje thing at a time." He might be too young for this, but did you see Playmobil's Dinos line of toys? 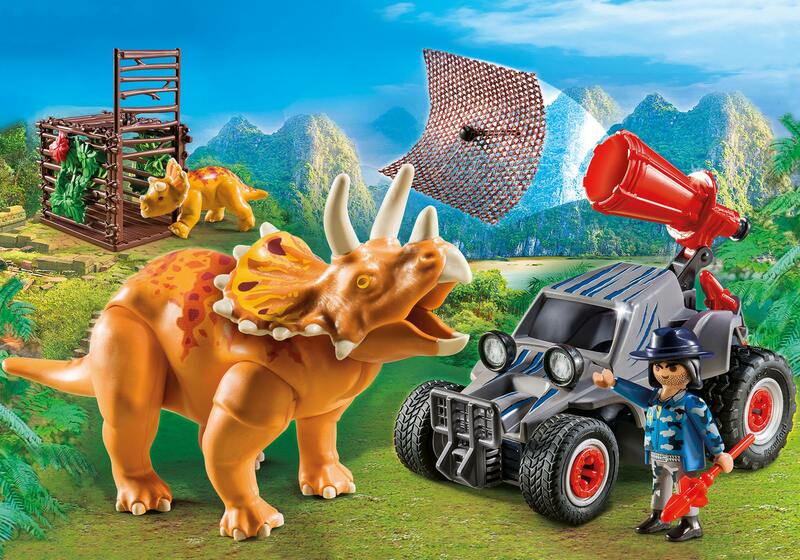 It seems to be a Playmobil take on The Lost World and Jurassic World. They're a bit pricey, but the quality is usually there and in my experience, kids love it and can provide literally hours of fun. I remember Playmobil when I was a boy. That picture above is the first time I've seen an actual image of it in about 30 years! I also had a fireman with a hose and fire hydrant, and my younger brother when he was very young had a air rescue helicopter. I knew they were still going but I din't know anything about the dinosaur range. Yeah, I didn't even know about Playmobil until I started working at Barnes and Noble and all of these clickies showed up on the shelves. From what I've read, it's generally pretty big in Europe and Britain the way Fisher Price toys are here in the States. I once bought a Playmobil Christmas market set for my neice and she played with that thing for HOURS. Who knew you could get that involved in an imaginary market for that long... LOL. I actually got Buttercup's sons one of the Pirates boats a few years back and it took her a few hours to assemble it. Hee hee hee! Anyhoo, I thought bringing up the Dinos line might be useful to you in the future.